This article was written by Eva Wasney and published in the Brandon Sun on Monday, May 30, 2016. It is republished here with permission. Indigenous dancers, singers and drummers from all over Manitoba and Saskatchewan came together on Saturday afternoon to celebrate Brandon University’s 2016 graduating class. Roughly 200 spectators and participants were in attendance at the opening grand entry of the sixth annual BU All Nations Powwow, which took place in the campus’ Healthy Living Centre. Dressed in full regalia, 25-year-old Aaron McKay was excited to cap off his university experience by performing at the powwow. “It’s almost like the closing remarks to a speech … it’s like a victory to me,” said McKay, who graduated with a bachelor of education degree on Friday. McKay is Anishinaabe from Rolling River First Nation and says that while he hasn’t decided what he wants to do post-graduation, he is relishing in the opportunities available to him and his newly minted degree. “Right now I’ve just been exploring what I can do with this degree and where I can go — because honestly, it can take me anywhere,” McKay said. On Saturday, 12 drum groups kept the beat while dancers of all ages performed in different styles during the all-day event. McKay was set to perform in the mens traditional category, but he had his fingers crossed that a “crow hop” dance was on the docket. The powwow also included a Métis jigging contest and a community feast and was expected to last late into the evening. “We get out of here at about 10 p.m.,” director of BU’s Indigenous People’s Centre Lisa Whitecloud-Richard said. 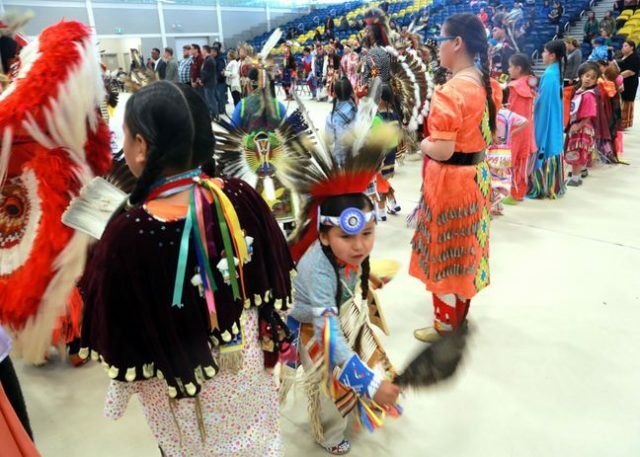 Graduation powwows are hosted by many post-secondary institutions in Manitoba, and Whitecloud-Richard says the events are a chance to get back in the groove for those planning to compete on the summer powwow trail. “You don’t get this at home when you’re trying to practise, so these are good little occasions for people to warm up for the powwow season,” she said. However, the BU event is less about competition and more about celebrating the university’s indigenous, Métis and Inuit students. BU president and vice-chancellor Gervan Fearon was on hand for the powwow’s grand entry — along with several other representatives from the school’s administration and the Brandon University Students’ Union.